If there is one thing great about playing a game that has been around for at least three years its that there is no shortage of information available. There are wikis, guild websites, blogs, and forums devoted exclusively to the game and its content. 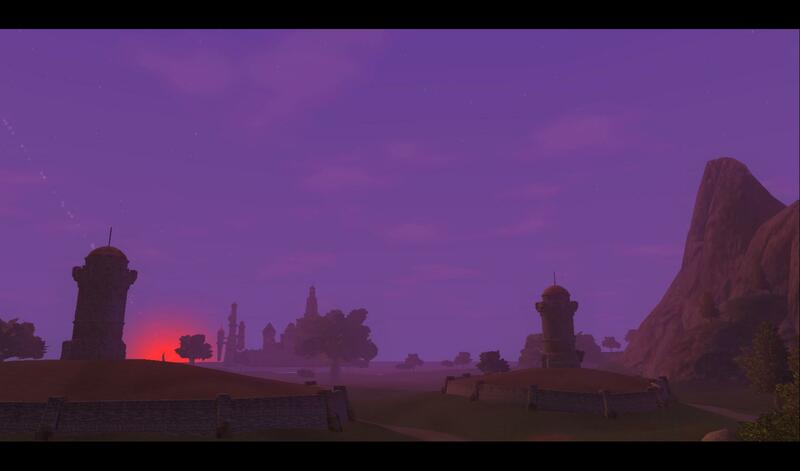 Kendricke over at Clockwork Gamer has made some posts recently about the deity system of EQ2 and it looks as if he will be going into the different alignments and the benefits of each. Rather than wait for him to post his section about the Malevolent and Neutral gods of the realm, I went ahead and did some research on my own and jumped in this weekend after making my decision. Its funny. After going through the list of gods and reading over the different Miracles and Blessings that were available from each, I had a weird sort of revelation about myself. In life, I am an empathetic person. I often find myself being the bridge between people in a conversation or, in the case of an argument, the one who works to alleviate differences. An intermidary of sorts. People don’t ask me to be, its just something I find myself doing from time to time. Now, I may have the definitions behind alignments all screwy here, but maybe its because of this predisposition in life that led me make the decision to go with Brell Serilis. I spent about two hours on Friday going through the lore and also reading a really good section of the EQ2.wikia.com site about the Tome of Destiny. If you have never taken the chance to read this and are either a fan of EQ2 or just like the game lore in general, then give it a go. Its not a long section and there are only 10 pages or so to it. It basically covers what I understand to be the time between Everquest 1 and Everquest 2 from a lore perspective. I may be completely off base here but, as I said before, I never played the original Everquest and only have what I hear from others and what I have read in passing to rely on. The Tome details the events around The Shattering of the moon of Luclin and seeing how this was a playable area in EQ, it seems logical that we are in a time-line of somewhere in the future. When I read the first section of the Tome, I couldn’t help but be drawn to Quellious and the way she handled the discussion during the council, but as it turns out, she is of the Benevolent faction and unavailable to me as a human who started in Freeport. Sorry Quell, you wouldn’t work for me as a Beserker anyway. Also, something about choosing a child goddess doesn’t sit well with me. Brell seems like a good choice and I finally finished the first part of proving my worth to him last night. I had to travel to 4 different dungeon areas, 2 in the Commonlands and 2 on Antonica. If you are level 25 or higher, you can walk through the entire content for three of these dungeons. 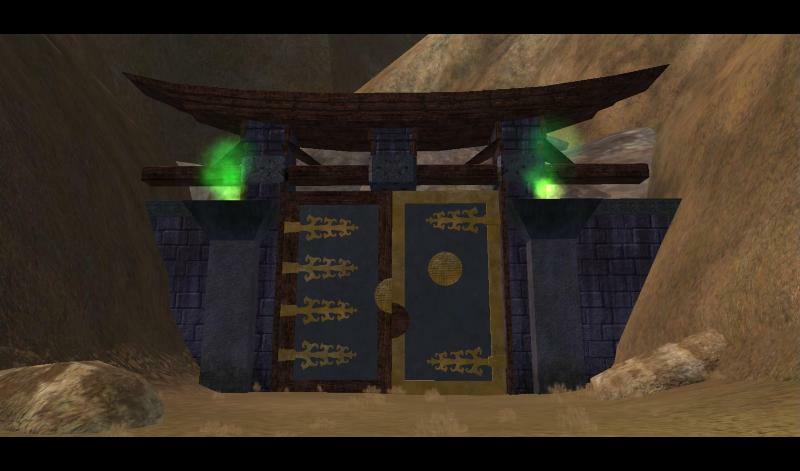 The last, Fallen Gate, needs at least a 4 person group in order to reach the area you will need. While you are in there, be sure to stop by for some Gnomish Stew, its the best! Looking for a way to see what quests you and other players in your group share? Well, you can, and its been in all along, it just doesn’t become available until you join a group. Logical enough. In your journal (J), you will find another tab labeled Group. 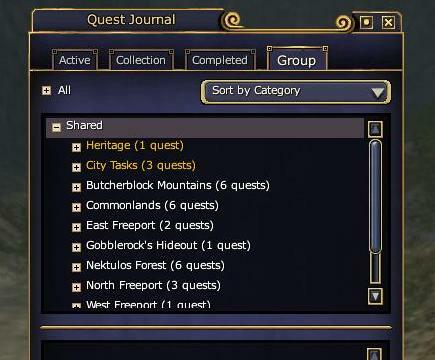 This page has a list of everyone in your group and also a complete section titles Shared for the lists of quests you all share. I missed this function in LotRO and I strongly feel its needed in every game that has as many quests as our current crop does. Please take note. I forget the time frame exactly, but I believe EQ2 is roughly 500 years in the future from EQ1. The heritage quests you will discover along the way, those are all quests for an item that, at one point in time or another, was a very coveted item in EQ1. There are some interesting parallels between the games… such as the raid zone in Fay that I believe is called New Tunaria. In EQ1, this was Felwithe… the home of the high elves. It is now populated by vampires. During the course of EQ1, an expansion was released called The Lost Dungeons of Norrath. In that expansion, some hidden dungeons were discovered not too far from Felwithe and they were all populated with vampires. As you discovered the lore of the dungeons, you learned that they had a plan to attempt to take over Felwithe and drive the high elves out. I believe it is this zone that is now run by Mayong Mistmoore. Mayong Mistmoore was a dark elf turned vampire lord in EQ1. The dungeon of Mistmoore (or castle of Mistmoore) had a coffin that Mayong supposedly slept in. In the very early days of the game, Mayong was a rare spawn within the zone, but he was so buggy that the developers eventually took him out and he became a GM spawned event only. In later expansions, he reappeared as a boss mob of some other raid zone. There are a whole lot of things like that in the game. I started my diety quest this weekend too. For my dirge, there was no other choice but Bristlebane. Back in EQ1, dieties that you worshipped had less significance. There was cultural armor and a few quests here and there, but for the most part, it had an impact on your faction and little more. I could be wrong here, but I believe that a half-elf bard who worshipped Bristlebane was the only race/class/diety combination that had no benefits whatsoever… no cultural armor or anything. Still, Bristlebane is the great prankster and that just fit my personality and playstyle so well. I was extremely excited when Bristlebane returned to Norrath recently so that I could choose him as my diety once more. And, true to Bristlebane style, my first quest to prove my loyalty requires me to play a practical joke on another NPC. This should be interesting. lol that sounds awesome Rao! I love the humor that the devs place in this game via the lore. Its really fun. Thanks for the heads up on the time-line. Really intersting stuff. You may have just convinced me to start a fae now. I needed to roll a new toon anyway to get some low level items to transmute. It’s pretty sad actually. I forget to call family members on their birthdays but I can remember nearly every piece of lore I’ve read about Norrath for the last 9 years.